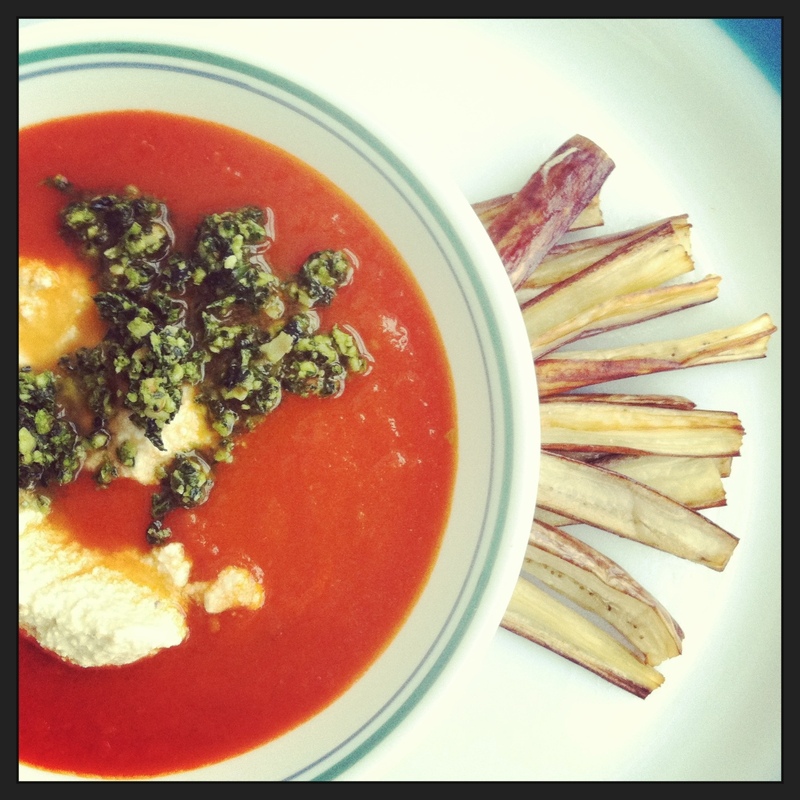 Tomato Soup and Eggplant Fries. | Eat More Plants. Sometimes I feel the need to clear everything out of the pantry and fridge. This lunch was the result of one of those feelings. And it came out quite delicious. Sometimes less ingredients give better results. I need to remind myself of this! There are a bunch of different parts to this collaboration style lunch, but all fairly easy to make. No worries here. Heat 3 tablespoons of oil in a large sauce pot, over medium heat. Add in onions and stir. Cook for 3-4 minutes, turning heat down to low. Add in garlic, vinegar, red pepper and another tablespoon of oil. Cook for another 5-7 minutes, stirring and checking that nothing is burning. Keep heat low. Add in the whole can of tomatoes, juice and all, and stir to combine. Turn heat up to medium until everything comes to a low boil. Turn heat down and let simmer for 20 minutes uncovered. Use an immersion blender to get a creamy, smooth soup. If you don’t have one, put your soup in small batches into a blender. Leave it chunky or as smooth as you desire. Let simmer for another 20 minutes, or until it’s as thick as you like! I topped this soup with kale pesto & cheesy cashew cream. Add all ingredients except olive oil to a food processor. Pulse until combined and starts to look pesto-y. Slowly stream in 1 tablespoon of oil at a time. Stop at 4 tablespoons and taste. If it’s creamy and blended enough then you’re done! If not, keep adding in 1 tablespoon of oil at a time. This will last 1 week in your fridge. Makes about 1 and 1/2 cups. Optional: herbs and spices of your choice. Sometimes I throw a tablespoon of chopped fresh thyme or chives. Experiment! Blend all ingredients in a high speed blender. Taste and make changes if necessary. If it’s too thick, add a tablespoon of water at a time until you get it right. I like mine fairly thick, like a sour cream consistency. Will stay good for about 1 week, refrigerated. I also sliced a graffiti eggplant into fry shapes, tossed them in oil, sprinkled with salt and baked for 20 minutes at 375. They were a little softer than I had hoped but I’m sure breading or flouring them would give a crisper exterior. Will have to play around with this one. 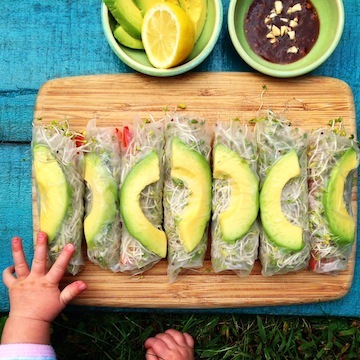 I also used my kale pesto in a raw coconut wrap the other day with lemon and avocado. It was perfect. I’m sure it would be amazing on pasta as well but I haven’t gotten that far yet…! i LOVe the look of this!! i saw it on Instagram…. Judging by the recipe, this looks like it serves 1 maybe 2? Oops! Sorry I didn’t specify, yes plenty of soup for two, maybe three people.